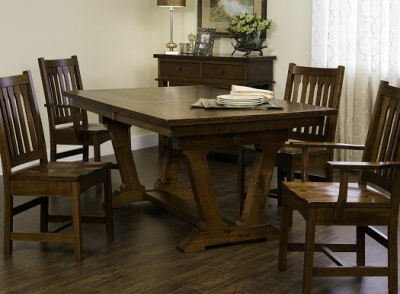 Amish Furniture Warehouse, located in New London Wisconsin, offers you quality, handmade Amish dining room furniture. Our dining room selection is unmatched. Solid tables and chairs that are built in a variety of woods, including: oak 1/4 sawn, white oak, rustic cherry, maple and brown maple. Using two different types of woods can dramatically change the entire feel of a regular table. An example of that would be the table pictured at the right. The quality you find in an Amish Dining room table is like no other. You will not find pressboard or plywoods in any of the tables or chairs that we carry. Our furniture is built with true solid wood. Our pedestal tables feature gears that open easily, and our leg tables have their own slide system. Most of our tables have self storing leaves, but if you choose, there are leaf storing credenzas available. Credenza can also sport a wine storage. Every table and chair has a satin finish, which will help reduce scratch visibility. You can't find a better table on the market with as much flexibility in choices. The Amish care about the products they produce. That is why we carry it! 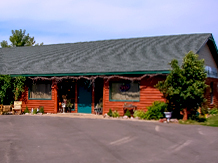 To view the entire collection, including tables, chairs, china cabinets, hutches, and buffets, and to really appreciate the quality and craftsmanship, you need to visit our store, located 5 miles west of New London, Wisconsin.